As much as I’m not a fan of Julie Schwartz’s “dire situation” covers, as has been amply noted in this space before, this one is a pretty good looking piece of art. Had it been the only one of its ilk, it would have been a nice change of pace and perhaps a standout, but, when you’re hit with them one after another, their impact is severely blunted. 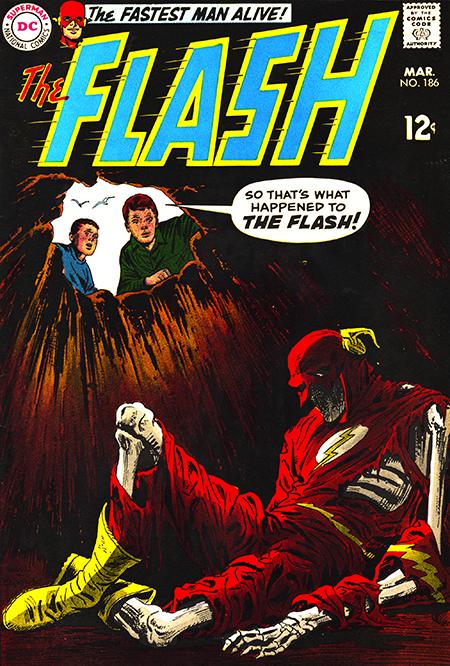 Especially when you consider that one of the Flash’s on the rise villains, the Reverse Flash, is featured in this issues’s book length story. It would have made a lot more sense to have displayed him on the cover. The stories are all book length by this time by the way, but they’ve yet to become the ongoing serial that was the purview of every Marvel comics on the stands. The Flash-Reverse Flash plus a mysterious new-old character in… Time Time Three Equals…? How’s that for an appetizer? Now take two slices of the typewriter of Mike Friedrich, slap on a piece of the pencil of Ross Andru and top it off with a layer of ink from Mike Esposito and you have the secret recipe for a story sandwich! Proceed to the next page and enjoy your snack! Dear Editor: Now Let’s see… in “The Flash’s Dead Ringer” this guy Frog for some reason suspected that Barry Allen was the fearless Flash. So Allen, somehow, learning about Frog’s suspicions, poses as a poverty-stricken actor whom Frog, for some reason, asks to pose as The Flash. Then Frog, for some other reason, orders his man to bump off The Flash, but to leave Allen alone if he’s The Flash, which he might be. So Allen, to throw Frog off the track, has his wife masquerade as himself. And a man in a black shirt and dark glasses, and looking for all the world like a Mafia hood, pretends to be a policeman. Oh, and the assassin’s bullet made no noise because it luckily dropped into the thick soup. Aw, c’mon. Well, fans, there’s our plot aside from Frog stealing Captain Cold’s thunder. I hope you misunderstood it as well as I did. Thank you, Peter, I rest my (our) case.